I just ordered these and can't wait to receive them! I couldn't resist ordering it, I've waited this for ages. Received yesterday, and absolutely no regrets. A delightful facsimile, cleaned just what is necessary, without distorting it, for a very lively result. To propose 7 supplemental cards with minor corrections is a good idea. Already a favourite of mine ! I am very grateful for this...I had to order! 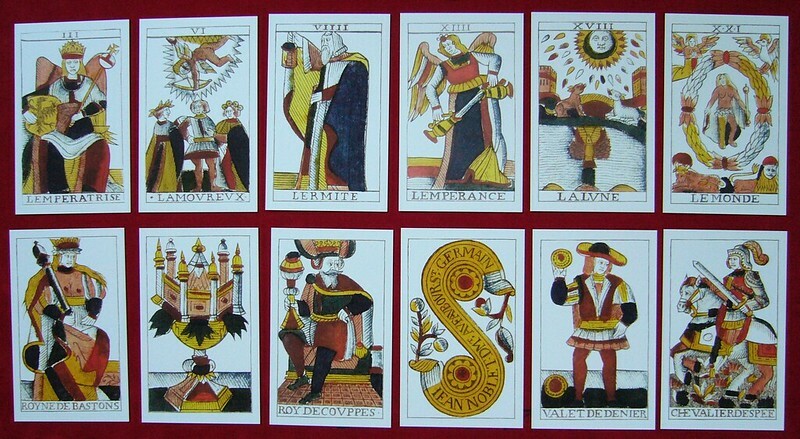 I've been looking for a good reproduction of this deck. I forgot to mention this in my previous posts : d'Allemagne who is so erudite proposes a later date for this deck than the one generally admitted, ie Louis XV's reign rather than 1650. He doesn't give further justification and the Noblets being parisian, whinch implies missing records, it's diffcult to decide.